This two-in-one anti-allergen carpet cleaning treatment reduces allergens from dust mite waste, pet dander and other sourceswhile cleaning the surface. Its special formulation contains tannic acid to neutralize environmental allergens and non-abrasive, sponge-like particles which contain a water-based cleaning solution to refresh pile fabrics. For optimum treatment benefits use X-Mite® in conjunction with Allersearch® ADS™ or ADMS™. Sprinkle X-Mite® evenly onto dry surface to be treated. Use a clean broom or a brush to work the powder into the surface. 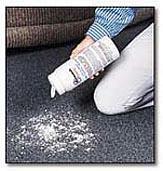 Allow X-Mite® to remain on carpeting for approximately three hours for optimum effectiveness. Vacuum treated surface with a new vacuum bag to ensure untreated allergens are not transferred to the just treated surface. Re-treat surfaces every 90 days* to maintain deactivation. * For severe allergen concentration, it may be necessary to apply X-Mite® more frequently. Pillows and mattresses should be enclosed in a mite-proof casing for maximum effectiveness. Allersearch® X-MITE® comes in a convenient dispensing pouch sufficient to treat an average-size room. Allersearch® X-MITE® is available from our specially trained Allersearch® ALLERGY SHOP Associates within our Retail Stores and through our catalog or interernet shopping. PRICE: $ 24.95 FOR 1 LB.